Renew your AGA membership (or join for the first time) and get free issues of Go World magazine, courtesy of the American Go Foundation. The more years you choose, the more issues you get. One year gets you two issues, two years gets five, three gets ten, four gets fifteen, and five years or more gives you twenty issues, and access to the rare issues that we have only limited supplies of. With analysis of important games by top pros, instructional material for all levels, news and other features Go World Magazine is the ultimate resource for the serious player. The AGF has acquired the entire remaining inventory of this wonderful magazine. Some are quite plentiful — we have more than 600 copies of some issues — other rarer issues we have only a few of. When they’re gone, they’re gone! Click here to view the contents of each issue. Click here to make your choices and submit them online. Note: please renew your AGA membership first, and then fill out the form. We are offering this special through October. About timing, probes, monkeys and wriggling. Younggil is going to show you a game played between Choi Cheolhan 9p and Mok Jinseok 9p from the 20th GS Caltex Cup Final, Game 4. You’ll learn the direction of play and the right haengma when you’re in a battle. You can also learn how to deal with a ko fight, and a tip for ko threats from this game. Ida wins Judan title: The final game of the 53rd Judan title match was held at the Nihon Ki-in in Ichigaya, Tokyo, on April 22. The challenger, Ida Atsushi 8P, had taken the lead in the match by winning the second and third games, but Takao Shinji 9P, the title-holder, evened the score in the fourth game. The nigiri to decide the colors was held again, and Ida drew black. The lead in the game switched back and forth, with both players having winning chances. Late in the game, a large group of Black’s came under attack, but instead of just making two eyes Ida countered by setting up a capturing race that he won. Takao resigned after 217 moves. This gave Ida the match by a 3-2 margin.This is Ida’s first title. At 21 years one month, he is the youngest player to win the Judan title and the third-youngest player to win a top-seven title. Ida became a professional in April of 2009, so it has taken him exactly six years to win his first title. This is a new record (it used to be held by Iyama Yuta, but he took seven a half years to win his first top-seven title). photo courtesy Go Game Guru; click here for the Game Guru report, which includes game records. 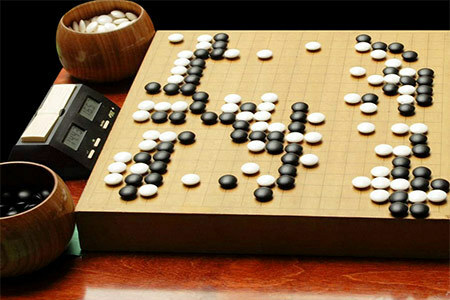 Meijin League: One game from the Meijin League was played last week. Takao Shinji 9P (B) beat Hane Naoki 9P by resignation. Takao improved his score to 3-1, drawing even with Kono Rin 9P and Yamashita Keigo 9P. The provisional leader in the league is Ko Iso 8P on 4-1.
one. The top players from a large-scale knock-out tournament (with about 400 participants, including four amateurs) move up into the C League (32 players), above which are two B Leagues, the A League, and the S League (so the leagues are in four stages). The winners of the leagues meet in an irregular knock-out tournament, the winner of which meets the winner of the S League in a play-off. The latter is given a one-win advantage in this play-off, so he has to win only one game, whereas his opponent has to win two games to become the challenger. The six-player S League is at the peak of the tournament pyramid, so I plan to report just on its results. The members, in order, are Yamashita Keigo 9P, Murakawa Daisuke Oza, Takao Shinji Tengen, Yoda Norimoto 9P, Yamashiro Hiroshi 9P, and Kobayashi Satoru 9P. Cary Chinese School won the team competition and Eric Zhang 5d (right) topped the individual competition in the 2015 Carolina Spring Go Tournament. The 12th annual tournament Carolina Spring Go Tournament, held in Raleigh on April 19th, co-organized by the Chinese American Friendship Association of North Carolina (CAFA), Confucius Institute at NC State, and the Cary Go Club, attracted 28 go players with a wide range of ages and go experience but with an equal amount of love for go. Nine young players from Cary Chinese School’s go classes formed three teams to compete in the team competition. As expected, the team competition generated a lot of excitement, with young players eagerly reporting and checking the scoreboard during the breaks between rounds. CCS Team 1 of Alvin Chen, Alex Kuang and Ellen Zeng, and CCS Team 2 of Andy Chen, Jasmine Ye and Ethan Wan scored the same 9 wins (out of 12 games), thus tied as the winners of the team competition (photo at left). In the individual competition, Eric Zhang 5d, of Chapel Hill, won the open section championship with a score of 3-1. Andrew Zalesak, 1d, of Cary High School, won Section A with a perfect score of 4-0, including an impressive win over a 3-dan player on a non-handicapped game with no komi. One of the youngest players, Ethan Wan of Cary Chinese School won Section D with a perfect score of 4-0. Alvin Chen won Section B with a score of 3-1 while Ellen Zeng and Alex Kuang tied for the first place finish in Section C with the same score of 3-1. Below is the complete list of winners. Joshua Lee 6d (at right, front) swept the ninth annual Orlando Go Tournament, held April 18-19 in Orlando, FL. The event was well attended, with 37 players, ranks 20k-6d, arranged into four divisions. This is a commentary of game 11 of the 5th Huang Longshi Cup. The game was played between Song Ronghui 5p and Choi Jung 5p on April 8, 2015, in Jiangyin, Jiangsu, China. Song Ronghui 5p (left) and Choi Jung 5p at the 5th Huang Longshi Cup. Song Ronghui was born in 1992, and became a pro in 2006. She won a gold medal in the Women’s individual division at the 1st World Mind Sports Games in 2008. Song Ronghui 5p at the 5th Huang Longshi Cup. In 2009, she won 2nd place in the 3rd Women’s Xinrenwang (Rookies’ Cup). She lost to Tang Yi 2p in the final. In 2014, she won three games at the 4th Huang Longshi Cup, as Team China’s first player, and China won the tournament. This year, she won fives consecutive games against O Junga 2p, Hoshiai Shiho 1p, O Yujin 2p, Xie Yimin 6p and Kim Chaeyoung 2p. This was her 6th game in the tournament. Song’s style of play is thick and solid. She’s also good at fighting, but it seems like she prefers peaceful games because she’s good at the endgame. Choi Jung was born in 1996, and became a pro in 2010. Choi is currently the strongest woman (ranked #1) amongst Korean Professional players. Choi Jung 5p at the 5th Huang Longshi Cup. She contested the final of the 5th Women’s Kisung, but lost to Rui Naiwei 9p in 2011. However, it didn’t take long for her to win her first title, the 13th Women’s Myeongin, in 2012. In 2013, she won the Women’s Myeongin again and brought the 3rd Huang Longshi Cup back to Korea. She defeated Yu Zhiying 5p, Li He 5p and Wang Chenxing 5p, to seize victory for Team Korea. In 2014, she won the 5th Bingsheng Cup, defeating Rui Naiwei in the final, and it was her first international title. She also won the Women’s Myeongin for the third time in a row. Choi’s style of play is flexible and powerful. She prefers a fighting style game, and her nickname is ‘girl of great strength’. This was Choi’s first game in this tournament, and it was the most interesting match in the final round. Members of the Brooklyn Go Club will be teaching go from 1:00–5:00p this Saturday and Sunday in the Brooklyn Botanic Garden’s Osborn Garden at this year’s Cherry Blossom Festival, or Sakura Matsuri. They’ll be joined by the Gotham Go Group and anyone interested is welcome to join; check out the event posting on Facebook. And check out the 2014 festival video here.